We knew that this year's trip was going to be different. As many of you are aware, over the past few years, we have started to venture much further afield with our outreach. As donations of clothes, shoes, medicines, toiletries and toys increase each year, so too does hour aim to help as many people as we can; wherever we can. As a result, wearing the orange COGS t-shirts was deemed inappropriate as we were supporting projects not recognised by the COGS trustees, so we decided it was time to make a mutually-agreed change. Wearing our new blue 'Friendly Smiles' charity shirts, we left for Banjul on Monday 5th February, with a busy itinerary planned for our 10-night trip. There were five of us heading out there, meeting up with more volunteers as the trip progressed. This year we donated both resources and funds as always to the COGS Nursery school in Jabang, Sekuta Medical Centre, Hart House School (for children with learning disabilities in Sinchu) and The Sisters of Mercy in Bakoteh, who run an orphanage/medical centre and hospital providing palliative care. The weekend of our trip, as planned, was spent at Lamin Toube Nursery School, where along with our friends, fellow Gambians and teachers, we totally repainted the school both inside and out, decorated the classrooms, replaced a blackboard, funded a new floor and at the end of a long three days in the heat and dust, were able to leave them caseloads of resources, toys, stationery and playground items. We also began to plan the training of its staff, as currently only the headmaster is qualified. We are now arranging the funding for the four teaching staff to attend college. Simon Mendy, Headmaster from the COGS Nursery School was also heavily involved; sharing his experience and expertise with the headmaster there, which was a joy to see. The whole three-day project was teamwork at its very best: one big family. Seeing the children return to their school on Monday morning was such a joy to witness - they were literally in shock and could not believe what they saw, shouting that it must be magic! Although I think our paint-splattered clothes, flip-flops and hair, might have suggested otherwise! During this year's busy trip, we also visited the village of Jabangjelly in South Kombo and were horrified at the conditions in which they are left to run their village Medical Centre. With a dangerous, collapsing ceiling and leaking roof, broken windows and very few resources, they struggle to care for their community, but still continue to do their very best for everyone: including the running of a regular vaccination programme and continual antenatal and postnatal care for the mothers. We were pleased to be able to leave not only a case of Paracetomal and Calpol, dressings and plasters, but also a share of the funds raised over the past year at our bingo nights, which were used to pay for quantities of desperately needed antibiotics, provide fuel for the village ambulance and pay for electricity to the centre. The donation of knitted blankets, baby clothes and hats were gratefully received by the mothers attending the clinic and it was a joy to share smiles with so many people. Our aim now however, is to raise sufficient funds to enable a much needed refurbishment - with a new roof and windows being priority, and I will be wheeling out that bingo drum again soon to start raising funds! In my nine years of visiting Gambia, I can honestly say, I still speak not a word of Gambian. I was asked again a few days ago 'how then, do you manage?' There are actually two reasons why it never causes a problem. Partly because English is the language in which they are all taught through school and we are always impressed with how well even the youngest children can manage. But the second reason is the main one, as simple as it might sound: a smile speaks a thousand words. 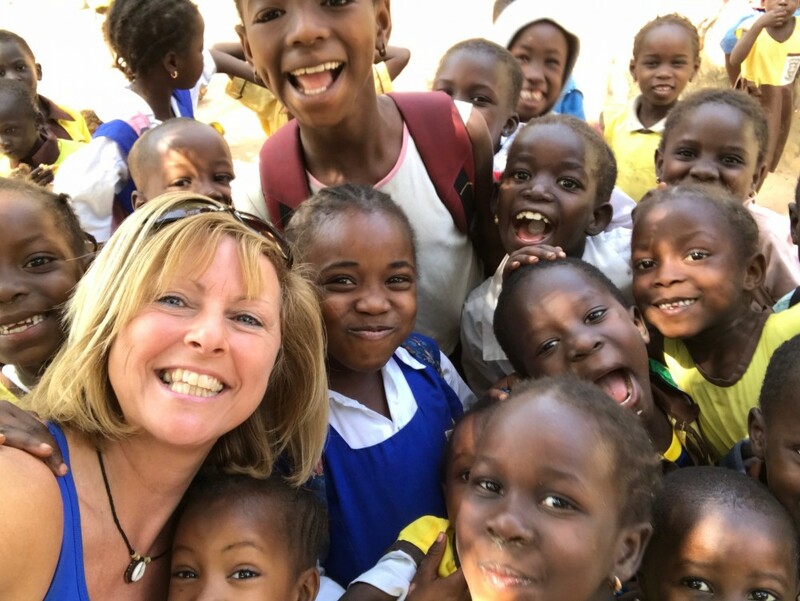 From the bottom of my heart, and on behalf of the families and children of Gambia, and my lovely friends Jolene, Patricia, Mary and Alex, thank you everybody for your continued support.